The IEA is the kind of organization that runs global summits selling carbon capture. That’s a process so fantastically inefficient it wastes 40% of the electricity a coal plant makes while it stuffs a useful fertilizer in a hole in the ground. With that context, I note that even the IEA is warning Australia not to get too carried away in its Speeding Green Transition. Presumably Faith Birol, IEA head, is worried The Renewable Crash Test Dummies might actually crash. About 3400MW of solar, more than the capacity of Victoria’s twin Loy Yang coal-fired plants, is expected to be installed this year in Australia with a further 4300MW next year, according to the Clean Energy Regulator. To put that in perspective, our total grid is 56,000MW. We only had 4,000MW or so of unreliable power in December last year and were already struggling. Now we have 6,000MW and look like adding another 3,400MW of solar – in the next year. And that doesn’t include the extra wind power. The Crash Test Dummies go double or nothing? Bill Shorten, Labor opposition leader, is even scaring the green establishment players? With a Labor win looming in our next federal election (6 months away) it appears even some eminent Green fans are worried Bill Shorten might drive the Australian grid and economy right off the rails. Presumably if we get too far ahead of the other trainwrecks-in-action they might balk at the flaming spectacle ahead? The ideal process, apparently, is to all get wrecked at the same speed. Neoen, owner of the giant Tesla battery in SA has jumped on that bandwagon too. Xavier Barbaro, Neoen’s head says the IEA is right. –“Renewables rush poses risks to reliability of energy supply: warns Neoen”. But how much is he concerned about sensible policies and how much is he concerned that the goldrush for renewables is also attracting fly-by-nighters? Barbaro translated “Give us your money”. Would you like $79 billion of useless infrastructure with that? And the $79-billion-dollars-of-part-time-generators will be driving the cheap reliable part out of business. Would you like to buy a second hand car that works two days a week (but you can never predict which day)? How did Australia get into this unreliable power and more expensive mess? Follow the money and you will find the solution. Or figure out what should have stopped this… all roads lead to the media. All they had to do was interview the best of both sides. Though any of our noble academic institutions could have spoken out but didnt. Think CSIRO, Faculties of science and engineering, as well as AEMO. I look forward to “Climate Nuremberg Trials” , Jo. History will be particularly harsh on those involved I think…. The IEA is quite right. The experiment is going way too fast. There are no economic storage technologies (except hydro where practical and built without greenies). Some storage may become useable as the cost of electricity rises sufficiently but the scale of the storage and its rated power will need to be of the order of scale that baseload now provides. Effectively, in the meantime, legacy baseload and peakers will have to fill the gap that storage would ultimately play (in their dreams of approaching 100% RE). The fact that legacy baseload will do so at ever increasing cost as standby infrastructure is conducive to the wishful thinking that some form of economic storage will appear on the scene. It wont be cheap, simply because the scale is so large, even if the unit cost of storage came down a lot. The experiment has gone too far already. The longer the subsidies persist, the greater will be the cost to rectify the damage done and return to a competitive electricity system. The IEA know one thing above all else…It Is A Scam! Like all scams, those running it know they need to pick their mark. If open slather, victims or those close by see the scam for what it is and the whistle is blown and the gravy train is derailed. Totally agree, a future Royal Commission will say the watchdog lost its teeth. By the time that might happen Bill will have turned us into a Republic, so any Commission is unlikely to be Royal. Malcolm Turnbull badly wants to be president of the first republic, so you are probably right. Why else would he be getting all matey with one of the hoi polloi? They’ve done, or are doing, a deal. Destroying ScoMo’s one seat majority ( Mal’s fault, remember ) was merely the beginning. You can bet that he and Lucy didn’t spend their time in Manhattan taking in the sights. And now, with the ACT Government planning to sue, we’ll have the legal profession to add to that list..
A sample of three letters. The first was published in SMH (Sydney Morning Herald) Wednesday Dec 5, 2018. The second sent by me to SMH also on Wednesday Dec 5, was in response to the first, but not published Thursday Dec 6. But the third was one of the four warmist-themed published by SMH Thursday Dec 6. The SMH editorial edict, outlined in reply #35 on Wednesday, is still functioning. ” No Tatiana Podmore, none of the above. At least some of us have studied the evidence and found it wanting. E.g CO2 is not a pollutant, it is a colourless, odourless and harmless gas at normal atmospheric temperatures and pressures. CO2 is at best, or worst (depending on your viewpoint) an insignificant “greenhouse gas” which follows Henry’s Law. CO2 is also a plant food, which is combined with water in the process called photosynthesis, in green leaves, to produce glucose. And recent research (Weiss) shows just two solar cycles explain all recent (last 10,000 years) closely. The IPCC models do not. Unfortunately the SMH is considered a quality newspaper by many in this state. It’s not just one reason but many really; indifference, ignorance, anti-conservatism, stubbornness, greed, stupidity, etc.. It’s actually a perfect storm for Australia. Our only hope now is for voters to wake up just in time and block either major party from forming government in their own right to send a powerful message that enough is enough. Time will tell if that’s the case, or we are destined to learn the hard way via a quick crash and burn under ALP+Greens or a slower one under the imploding LNP. Peter what you are advocating is a multiparty system similar to Israel, Italy and Mexico, to name a few. There is a lot more haggling but they seem to operate okay. Yes I understand that’s the case in many nations and it’s far from ideal. However, it’s better than what we have at the moment, which is one major party made up of the ALP (left) and Greens (extreme left) and the other major party being the LNP (dogs breakfast) both happy at increasing our dependence on renewables at the expense of coal fired power, while virtually everyone else is busy building coal and/or nuclear power plants as and when required. The current nexus has to be broken if we are to have any real hope of avoiding a crash and burn. If voters of Australia prefer a form of oligarchy run by the left then so be it – keep voting for the majors. It makes little difference who is in power given the LNP is riddled with leftists while centre-right conservatives are treated like the enemy within their own party. Follow the FREE money. Borrowed from super. Backed by the taxpayer. When it runs out more is borrowed. The ARENA, loaves and fishes shows. Not much has changed. I seem to recall the circus was upgraded to gladiatorial deaths. So more and far worse to come. When the money finally dries up, the music stops. What to do with all those solar panels and wind mills? Free power from free money owned by a state with no demand. We will be all to poor to pay, even when it is FREE! When will our government learn NOTHING is for FREE? Only when they are a lot smaller. Everything is “free” when it’s not your money. Until, as you say, it runs out. But by then you have harbourside dachas and special green lanes on the road to be driven along while you sneer at those in the bread queues. I mean, it went so well the last time. Shame when you think of the reliable power that could have been installed for $1 billion. The money has to be wasted….its the best way to drain an economy of resources by buying the equivelent of energy junk bonds…. Yep, one for all, and all for one. The collective goes down together. No one was responsible. The irony is that the Rainbow of Division becomes sharper and clearer by the day. Globullism is failing by the day and as is so often the case, down-under lags the curve. Destitution and social collapse for the great unwashed, while the Green Blob of elite social pus that are the legislators, propagators, commentators and educators suddenly realise that their ideology is sounding more like idiotology by the day. The time for the Yellow Shirt dance in Australia and New Zealand is almost upon us. The bulk of the public fell for it. Now the realisation of the consequences in regard to cost of living, growth and prosperity has been awakened in the general public, the turnaround has begun. The change In direction may result in social disruption including violent protests as occurring in Paris. How ironic it would be if the mass opposition to the Parasites Climate Agreement originated in Paris. It will be interesting to see if the protests continue until the existing fuel tax is also canceled. The “UN immigration pact” looms large. France may yet be ripe for a ‘Frexit’ campaign. It seems to becoming a slow motion train wreck. Here’s hoping. It would not only be ironic it would be so fitting and expected given their culture and history. What I fear is some extremist could sneak in and take control of the situation. The same goes for other prominent EU nations. Watch and learn. Also note the difference here in Australia. We are heavily subsiding renewables at the cost to the consumer and most of them are not really bothered about it apart from a bit of whining, at least for now. With the Grand Solar Minimum dawning, the narrative will fail absolutely, more than the unpredicted ‘Pause’ demonstrated. But whether we can tear the godforsaken reins of power out of their hands remains to be seen. I feel a struggle is inevitable. Yes a struggle is inevitable. The only question is will it be a struggle by the people who will have finally woken up to stop the rot, or will it be a struggle to come out of the ashes after the crash and burn has run its course. Time will tell of course. The true avalanche that ought be considered is that of a cascading grid collapse. AU is swiftly approaching that. Once the unreliable generation portion of the grid (non dispatchable, non synchronous, generation) reaches 50%, all it takes is a windless or cloudy day, or an unexpectedly warm evening, and the thermal plants won’t be able to handle the load. Or, one of the thermal plants is taken off line for maintenance and the winds slacken. Same outcome. Once the mains voltage begins to drop, the transformer taps are maxed out, and the load peaks, all it takes is a smidgeon of system imbalance and the grid safeties will engage and start dropping substations or radially fed loads like popcorn. A few days of blackout will provide for interesting times. It takes more power to restart the grid than it does to keep it stable at peak. Every motor/inductive load that remains connected requires 6 times its running power to restart it. Where’s that power coming from, eh? Somewhere around 40% to 45% or so of unreliables will be the tipping point for grid stability. All rational bets favor grid collapse shortly thereafter. The ensuing chaos ought to be a great teacher. Reality always has the last laugh. Great comment Lance on the coming Armageddon. Although some engineering commentators are suggesting the tipping point is below 40% renewables because by then voltage/frequency instability is already doing significant damage to attached electrical equipment and machinery. I agree with your main point, but just remember that when SA had the “black system” event two years ago, it was actually the coal fired plant that got blamed by the media. I can see ghost green infrastructure around in about 20 years, rotting in the new snow from the new LIA. It maybe sooner than 20 years. Let me say something about this, windmills extract energy from moving air, the moving air is driven partly by gravity and mostly by temperature differences driven by the sun, but solar energy is fixed. Wind is also resonant – like waves. So when you calm the wind with windmills you change the climate by creating energy and detuning (dampening) the resonances which is going to affect surface wind. Surely the klimatariat knows about this? Wait until the people find out, there will be an uproar. It might be prudent that the AEMO be required to post an updated “Black Start” plan prior to approving additional unreliable generation. Each and every time additional blocks of significant wind/solar generation is considered for generation or prior to closing any thermal plant. Every Green thinking person “knows” this ought to be a simple matter. Every Electrical Power Engineer “absolutely knows” that it is anything but a simple matter. So, let the AEMO take responsibility for their future choices by demonstrating how the “avalanche” will be recovered from, in advance. Sufficient data already exists to perform the load flow analysis necessary to predict the conditions and likely grid locations for brown/black outs. Just run the load flow simulation at peak summer load and take one or two thermal plants out of service. Then see what happens. A simulation is much less expensive than “smoke testing” the grid in real time. Lance – Green thinking person “knows” – too many oxymorons to count there!! Wish you would include actual proven average power delivery in brackets beside the fanciful nameplate claims of these renewable sources Jo ! Eg 4300mw (1290mw)Wind (860mw) Solar. The Climate Change sheep out here believe that these renewable plants actually deliver their claimed nameplate figures all the time. But the claim in brackets is a meaningless annnual average projection. You can only guess how much wind and sun next year has, they are not the same every year. exactly, and over time for specific regions they are accurate to within a useful order of accuracy. The perfect shouldnt get in the way of the good. What is good about an average generation figure when it is unknown WHEN that power will be available. Are you happy sitting in a traffic jam for hours because you know that your annual average speed is ‘good’? yes everyone understands intermittency, but you need some measure to have a “conversation” as people like to say these days. GWhrs produced over a year (or other period) is as reasonable a comparison. Intermittency is just another factor you can add in, however in general terms they get to dump all their power into the grid and others have to adjust, including when it equals zero. Dont get the car analogy. Yes even capacity factor doesn’t tell the story, I’d use 99.5% reliably delivered energy given available storage capability. That is around 3% of nameplate. Unlike fossil power you can’t hedge failures by adding redundancy because there is an unmanageable common failure mode a bit like an out of fuel failure that affects all units simultaneously. Coal plants can fix this by having multiple (redundant) fuel suppliers there is only one wind supplier. Right you are, Bodge. Capacity factors matter. As you imply, it is 30% for wind and 20% for solar On Average. That said, the Capacity factor of solar is functionally a sine wave ranging from Zero at sunrise to Zero at sunset and peaks at 1 at solar noon. Except for random cloudcover. The Capacity Factor of Wind is 0.30 on Average. But, on a windless day, it is Zero. The Load is whatever happens to be connected to the Grid. The Load has no idea that the Wind slackened or if it is day or night. Once thermal generation falls somewhere below 65% of the previous day’s peak Load, chaos can be guaranteed with a brief glance at the following day’s temperature profile or seasonal wind profile. And, unpredictable things do actually happen. Were I in Oz, I’d be investing in my own generator and a drum or two of fuel, and wisely betting predictable odds at the local bookmaker as to when the blackouts will occur. Good fun might be had. But then again, perhaps not, as rioting hordes of angry people are somewhat less than pleasant. Defined as the percentage of nameplate that a source CAN BE RELIED UPON to produce 90% of the time. Most coal and gas power stations can, if required, sit on above 90% of nameplate 24/7, and often do. Solar is of course ZERO ! Yes – it is reliability of supply that counts. We know Adelaide and Melbourne will be hot today. Solar will be near nill at 6pm when the evening demand picks up. Wind will likely be low. Electricity price in SA is forecast to reach $1750/MWh. Capacity factors are meaningless numbers. The more intermittent power that is connected the more the capacity factors become constrained by additional generation. There is no diversity fairy. When the wind blows in one place it tends to blow in other places and when it is not blowing in one place it is not blowing in other places. There is no solar at any night across Australia and many days when the whole country is covered by cloud. If average demand in the rid is 26GW then the 30% capacity factor typical of wind would suggest that a mere 87GW of wind capacity would meet the average demand. However there will be times when all that wind will produce near nothing an other times when it could be producing near 87GW but is demand constrained to say 18GW or much lower if the rooftop solar is cranking. Wind generator proponents in SA would be looking closely at how the rooftop take-up is eating into their demand. The actual large scale demand in SA was down to 340MW last Sunday. Rooftop solar was supplying 800MW. Within a couple of years there will be times when there is no demand for grid scale generators. The only requirement will be to have some synchronous generators spinning without load to provide frequency control. In a world where the RET exists, anyone able to install rooftop solar takes demand off the grid scale intermittents and that lowers the price of electricity for the consumers because the retailers pay less for rooftop solar with its RET credits than they pay for wholesale power plus the LGCs that are required with it. This should give any future investors in wind farms for SA, And even existing owners….cause to rethink the commercial viability of their investments. I dont really see a way out other than grid failure making things more obvious. The people dont understand, the pollies are only interested in virtue signalling and the “expert” advice is coming from bureaucrats not engineers. If enough band aids can be applied to contain outages to small areas then that can be explained away with spind and look squirrel! stuff and the can gets kicked down the road. is 0.00000% for both wind and solar. No-one can guarantee that the wind will blow or the sun will shine (on a solar panel) at any particular time. Now c’mon John. That’s so unfair. There will be some number with a few less zeroes (and I want to know what it was). Anyone? What’s the lowest % on the worst day (for solar and wind) in the last three years? And with the caveat that I’m not interested in “90% of the time”. We want electricity 99.9% of the time. Perhaps we need the second worst day in the last three years. Looking at Anero.id data, for Nov, wind dropped below 400 MW on Nov 10, 11, 16 26, 27, 30 for 3 hour periods. And in Oct 6, 21, 28, 39,30. That’s a capacity factor below 10% across the entire grid from a nameplate of 5400 MW. Tony’s summaries can provide further data by day for 16 weeks. April looked to be a bad month with 10 days of low generation. A stationary wind turbine consumes power for a stack of purposes, so you are looking for a negative number which, unsurprisingly, is a bit of a secret. Statistically, Wind in Germany gives a minimum 4 and 5% of nameplate, 90% of the time. That is what I was looking at. I totally agree with all other comments by you and Jo. They are both is manifestly and totally UNRELIABLE. rioting hordes of angry people are somewhat less than pleasant. … the tar and feathers can be removed. Oh the angry hordes will only be active for a few days. One of the biggest users of grid electricity is water treatment and distribution. You may have a brilliant idea and result afoot! Get legislators and lawmakers to pass laws that only all renewable energy be used for pumping water and sewage. Stand back for the education. Lets add pumping petrol and running aircon….. I tested my generator yesterday during a scheduled outage and it powered my household for more than 9 hours on the 5 litres of fuel I filled it with. Based on that, I may need another jerry can to supplement my existing one but I’m feeling reasonably prepared. The truth is that most Australians do not even understand what nameplate means. They also seem to think that coal produces electricity and that steam is a pollutant. Maybe when all we have are mcjobs, we can ask if you want chips with your meal…. Maccas won’t be offering ‘mcjobs’ due to increasing brownouts and blackouts. Batteries, wind-turbines, solar panels. (Can’t add in the wave gen because it sank.) It’s interesting that these are all clunky old technologies whose narrow limitations have been known for yonks. The question we should ask is whether Our Green Betters would consent to a technology which was new and effective. Old and ineffective seem to be their primary conditions for implementing. Expensive, import-dependent and wasteful are the secondary conditions. The third set of conditions is that these limited technologies should not be used within their limits to meet the needs of remote communities and regions without grid access (they can go jump) but that diffuse, intermittent generation should be attached to the functioning coal-powered grid where its main contribution is making a mess. The answer is pretty obvious to me. The word “globalism” comes to mind. As do the words “blind malevolence”. Globalists would rather rule in hell than serve in heaven. As for serving on earth…Are we kidding? That phrase brings to mind the recently elected second term Premier of Victoria Daniel Andrews. During his first term, he outlawed fracking, banned other forms of gas exploration and forced the closure of the Hazelwood power station. Subsequently, his government has now approved the building of more wind farms and the subsidising of solar panels, while at the same time purchasing multiple diesel generators. I’d call it ‘green malevolence’, meaning that whatever we have to do to get rid of coal-fired power, we will, even if it means reverting to dirty diesel generators. From the point of view of Victorians, their politicians are delivering on their election promises. From the other side of the fence there is a built in requirement in our governance that “best practice” will be followed and where that understanding is bypassed there should be consequences. 1. Demolition of a significant state asset. impossible and even commercial offices and corner stores find power accounts a significant concern. High rise properties will become/are unsafe to use when elevators/lifts become “intermittent”. Being trapped in a lift for a few minutes is disturbing; an hour or two will be dangerous. 4. If Victoria was an independent power source, lessons may be learnt quickly but the connectedness that allows immediate social security benefits for the looming unemployed, the emergency back-up available from Tas, the Renewable Subsidies/Living Allowance paid by other states, might see the penny drop too far off in the future to have Mr Andrews held to account. He’ll get his pension and a nice portrait hung in Parliament. Yes indeed. Politicians from BOTH sides have achieved this, as Guy promised nothing at all, to his eternal shame. He’ll get his pension and a nice portrait hung in Parliament. Of the two, i’d suggest only his pension will be nice. A portrait of Dangerous Dan? You should hear what my wealthy great aunt thinks of Glorious Comrade…..
Here’s one for you, on 30/07/2018 my mother turned 100. I applied through the appropriate channels, and she duly received her letter from the GG, and one from HM. She also received one from our then PM. She told me ” you can send that back. Awful man”. She cast her first vote for Bob Menzies in 1939, and never strayed from what would become the LP until 2016. And yes, she’s still here. A little nice sarcasm there. It’s interesting that these are all clunky old technologies whose narrow limitations have been known for yonks. Anything else is over their heads. It’s the same with nuclear. Mention that and you get shrieks of outrage and a full list of all the known faults, flaws and dangers of the [obsolete] high pressure water cooled uranium powered breeder reactors whose design was set down in the late 1940s and early 1950s. It hasn’t changed from then. To them, that is nuclear, and it’s dangerous. That old clunky technology can be added to the list. I’m told to `go look at the devastation at Chernobyl.’ Yes, well, they’re right up to date, thirty years ago … the animal and plant life at Chernobyl is thriving. I agree with them: obsolete technology is often that way. - no need for burying waste—there doesn’t need to be any. Poor things. They’re also almost terminally afraid of `radiation‘ … there’s all the hundreds of deaths from the nuclear accidents. So I don’t tell them about the (mostly electromagnetic) radiation from the sun. That’s hundreds?. You’re in more danger of cancer from GCR (Galactic Cosmic Ray) exposure right now from flying. They’re at their highest as the Solar Cycle heads to minimum since the start of the Space Age. But that’s what we’re dealing with. What we are dealing with is more than 40 years of indoctrination and misinformation, while all they need is more detergent for the brainwashing machine. Totally agreed about Thorium and the rest. 40 years of faux science pushed in populist text books and school books, no reference to actual real results. But, I think Fukushima will bite the Japanese in the bum in the future, TEP mismanaged the whole thing from start, at least the Soviets buried the thing in concrete after it went up, at much risk to the workers involved. The truth is, you pay for 2 and get two. With electrical grids you pay for 2 and get 1. 97% of folks do not understand this, yet. It would not be so bad if this were true. Reality is a much much worse. An optimised system for intermittent wind generation will have a capacity factor of 12% so you need to buy 8 times the average demand for the generators. They all have to be connected to the grid. That means roughly three times the transmission and distribution. You then need to buy storage that costs as much as the generators. The overall cost is about 20 times what it is for coal plant. The working life of the intermittent generating assets ranges from maybe 15 years for batteries, 20 years for wind generators, 25 years for solar panels and up to maybe 100 years for hydro storage and generation. These compare with about 25 years for gas generators and 50 years for coal generators. Of course you do not need to keep buying coal or gas. Who knows when reality will strike. In Germany, replacement of 20yo wind turbines is causing some reflection. Reduced subsidies mean new turbines have a more difficult hurdle. And with Adelaide in for a hot day, further evidence that unreliable renewable power can not prevent global warming. The mercury is set to soar to 39C on Thursday and 34C on Friday, forcing Hough and his staff to leave extra moisture in a pitch that will start out with a “nice, thick layer” of grass. So Perry refers to “CHEAP but intermittent renewables”. What on earth happened to my power bills over the last 10 years then? Shouldn’t they have gone down then? We need a battery. A big vast chemical battery. A big vast chemical battery based on maybe hydrocarbons. Are you implying that Coal is the biggest battery of them all. Another important facet should be that we can control the release of its energy. The amount of energy they say they are going to try to store in these “climate batteries” leaves me wondering just how safe they could be. ka– BOOOMM ! seems a likely outcome at some stage. I’d be more worried about the HF gas they give off when they burn….assuming the rotten things didnt kill you outright with an explosion, the resulting fire and HF gas might finish the job…. If you mixed HF gas and water from a firehose, would you wind up with HF acid? I’m not a chemistry dude, so…. As I have written so many times, the questions are why and how? The mechanism is the issuance by law and compulsory purchase of LGCs. Laughable Gobsmacking Great Carbon Tax credits just for generating power even if it is not sold. Most of $1Million cash per windmill per year just to exist, on top of what they are paid for the electricity if sold. The same with lunchtime solar panels. In the end the owners pay nothing and still get cash coming in for electricity no one wants or needs, dormitory suburbs where the people with solar panels are being paid cash by the people who do not have them, for electricity which is not wanted, needed or used. THe electricity distribution system from high voltage to low voltage does not work backwards any more than the water distribution system pushes water back up hill from rain gutters. High voltage industrial areas are not being fed by low voltage domestic supplies. When no one is home in a suburb, the payment for ‘free’ lunchtime power is insane. But wait. There’s more. Soon we will have to pay for their batteries. The argument for doubling down on our wasted cash is that these systems are utterly useless and we should have known that. So while we rail against the sheer stupidity of covering our landscapes and oceans with giant windmills, just remember who is paying for all this insanity. Not the ‘government’. You are. The medical industry endorses cholesterol lowering despite no true correlation with cholesterol and heart disease. The infamous Framingham Heart Study was an exercise in data cherry picking. IMHO if you take it to its logical extension, it was an excuse to push people onto a vegie diet to protect the mythical “Gaia”, and finds bedfellows with the current destruction of the electrical grid to protect ” Gaia”… it all seems to be linked. The windmill thing is just a nice money maker, while trashing our grid – but is based on faulty science, just like the cholesterol nonsense…. I cannot agree. Nothing to do with science. Without any science at all, it is extremely obvious Cholesterol blocks arteries and is lethal. So you hardly need a statistical correlation. Ask a cardiac surgeon. Look at the CT calcium scans. You can see it. Plaque arterial blockage is in the extremely obvious, visible category. The statins work to reduce the build up. People used to die routinely around 65 from blockages and now with stents, bypasses and medication people are living in good health much longer. This is a real, worldwide and lethal problem being fixed. It always existed but people did not live much past the retirement age and many even then many could hardly walk up stairs. They just died. Nothing could be done for cure or prevention. Once again ‘Our’ ABC is culpable for getting many people to drop their medication by pushing pseudo medicine as fact, but who is surprised? In total contrast, Man made Global Warming is transparent rubbish. There is no problem, no evidence, no cure. Pseudo ‘Scientists’ are still drawing lines on graphs to convince people that the temperature is going up rapidly when they are currently having really problems proving temperature is actually going up at all. Snow storms in New York and bushfires in California. So it’s Climate Change causing both simultaneously. One explanation for everything. Cured by a river of cash. Who after thirty years believes their world is hotter, the seas higher? Just go to your favorite beach. A freezing day is just the weather but a boiling day is ‘climate change’. The seas are rising 8 stories any day now, 100 metres in a century. By the warnings of ‘our’ ABC they should already be 30 metres over our heads. 22,771 people meeting in Poland now to decide how to get more of your money to fix a problem which does not exist, a problem which pays for their air flights, their limousines and their hotel rooms and their wages. These are people who have done nothing except make money from this. Point to one life saved. One life improved. No one can. It is the biggest scam in world history. There you have it, aunty has been pushing propaganda onto an ignorant electorate. ‘And in June, research published in Nature pointed to a tripling of the rate of melting of the Antarctic ice sheet over the last five years. ‘Now, new research published in Nature today has confirmed a similar trend is occurring in the Greenland ice sheet. It is the biggest scam in world history. I despair for Australia, and for mankind. The gradual brainwashing of the populace has convinced almost everyone to believe this scam. The media propagates it with almost daily scare campaigns of rising temperatures and sea levels. Unless you are aware of the alternative scientific view, your default position is that the planet is warming and mankind is causing it. The climate alamists teach this to their children, as we have seen recently in Australia and Norway, with teenage protests demanding action on this non-problem. I don’t have much hope for the next generation. Will they wake up to the idiocy being perpetrated on society, or will they lead us further headlong down the path to return civilisation to the stone age? We can turn this around very quickly if Morrison builds three new coal fired power stations, the centre left media would be forced to debate climate change. They will learn the hard way. The earth IS getting colder, geophysical FACT. The snow cover IS increasing slowly each winter especially in the NH. Even now NZ is getting bombarded with excess cold and Tasmania I saw Hobart was a tropical 13C. What happens between +- 27deg of the equator isnt relevant. The ice creep starts from the poles. Builds up and increases the polar albedo therefore more IR is reflected. The fools are preparing for a scorched earth, we will all die from heatwaves.. But this will happen – unable to power the grid due to no solar, no sunshine when it snows, possible wind increase as storms arrive but the windmills will break anyway. GD the klimatariat has put together a good yarn, so its up to us to come up with an alternative hypothesis. Greenland and Antartica are losing ice naturally, nothing unusual is happening. With the Arctic sea ice its the same story, the Atlantic Multidecadal Oscillation is the main driver and CO2 has no part to play. The body uses cholesterol in the blood to block minor damage to the arteries. Too much cholesterol can cause fatty deposits to build up and cause heart disease. But that cholesterol doesn’t come from cholesterol in the diet. The body make it itself. The cause of too much cholesterol in the blood stream is from a lack of exercise. The “food wars” on cholesterol (then fat), salt and sugar in the diet are largely caused by bad science and a need for scientists to be relevant (read activists). Most of it should be taken with more than a little dose of salt. I notice eggs, once “very bad” due to cholesterol, are now on the “good” list…. From my reading, one of the key predictors of likely heart disease, is stress. Cholesterol is recycled through the body, if your liver & gut function are poor, it could possibly leave excess cholesterol in the blood stream. If you followed drug company guidelines, approx 50% of all adults would be on cholesterol lowering drugs…..I doubt we have become so unhealthy 50% of every adult needs to be medicated. Life expactancy is way up, people generally have never been healthier. World J Cardiol. 2015 Jul 26; 7(7): 404–409. “Moreover, cholesterol may be associated with CHD but that does not prove causation. Despite the fact that high triglycerides and low HDL have long been associated with CHD, studies designed to raise HDL or lower triglycerides have failed to reduce CHD mortality. Another thing that I came across was saying the plaque that was building up in the veins was mainly calcium that didn’t know where it was supposed to go because of a lack of vitamin K2. I notice that most calcium tablets now contain vitamin K2. Without any science at all, it is extremely obvious Cholesterol blocks arteries and is lethal. So you hardly need a statistical correlation. Ask a cardiac surgeon. Look at the CT calcium scans. You can see it. Atheroma plaque is largely cholesterol, no doubt about that. And it would seem that accumulation of Cholesterol below the endothelium is an early stage of plaque. Calcium is different. Lots of calcium can be found in the walls of arteries without blockage or narrowing. But is it the primary problem and how did it get there? The whole metabolism and control mechanisms of Cholesterol are not understood at all as far as I can make out. I am happy to learn about it if anyone knows of good articles. Totally disagree with TdeF on cholesterol. This fallacy arose from the fact that they found blockages with cholesterol in them. BUT the cholesterol didn’t “block” the arteries. Heart disease (from mostly lifestyle/diet and NOT power station emissions) causes lesions to occur in arteries. The body uses cholesterol to help fill/repair those arterial lesions, which can result in serious blockage, but cholesterol will flow through healthy arteries, for ever, without blocking them. Don’t ask surgeons anything that isn’t associated directly with the surgery they do. Statins reduce cholesterol levels, sure, but that doesn’t make you healthier. Studies have shown that people on statins do not live longer than those who are not. Also they produce many undesirable unhealthy side-effects. The drug companies in their research to prove effectiveness of statins were allowed to drop-out patients who reacted badly or had adverse effects when put on statins. As any researcher should know, this would distort your results towards a positive result that may not be there if the whole study population were included in the stats. They were allowed up to a 20% drop-out, early in the study, for this. That’s a huge culling of bad results. Modified: Renewables rush poses risks to reliability of energy supply = Renewables rush poses risks to reliability of energy supply, full stop. As renewables depend on enough storage to pass themselves off as reliable, perhaps one of the trolls could explain why we are rushing into renewables 6 years before the largest (and probably cheapest) source of storage (Snowy 2) becomes available? AEMO grid demand in Australia averages about 24 GW, with summer peaks around 32 GW. To meet that demand we currently have about 34 GW of fossil generators (coal, gas and diesel), so allowing a 90% capacity factor that provides about 30 GW. Next in line is about 7 GW of hydro, generally ok except in major droughts, say 5 GW available. Then there’s wind, nameplate capacity 5.4 GW, delivering 1.6 GW on average, and sometimes just when you need it, zero. And finally there is solar, large scale 2 GW, small scale solar about 8 GW, and growing rapidly, but on average delivering 2 GW, and zero when you need it to meet peak evening demand. So we currently have sufficient reliable fossil/hydro capacity available to just meet peak summer demand. But the average utilisation of those reliable generators is being reduced as more intermittent generators (wind/solar) get priority access. More capital investment seeking a return, ergo higher electricity prices. And when does the crash occur? AGL plans to shut the 2 GW Liddell coal station in 2022 so is progressively reducing its reliability by doing minimal maintenance. 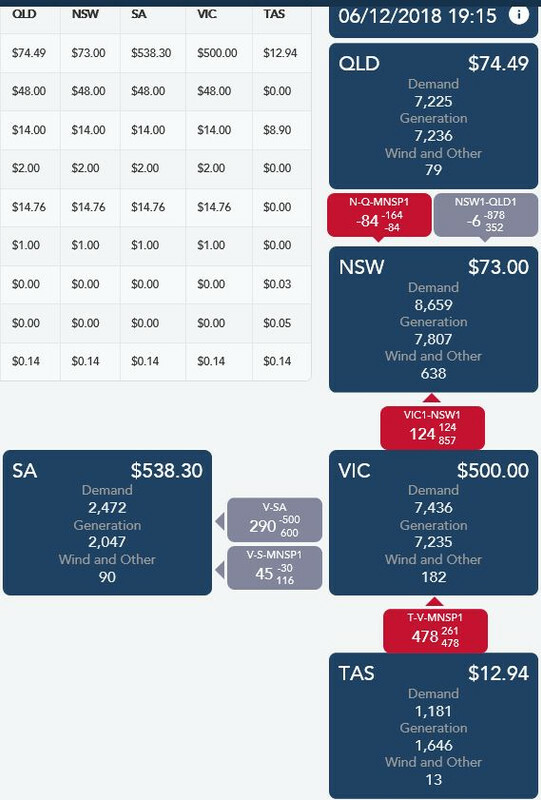 Other fossil generators with lower utilisation rates are relying on high wholesale prices to maintain cash flow to keep operating, but given the current and announced policies of even more intermittent wind/solar (average 40% of demand by 2025 in Vic, 50 % nationally by 2030), to deliver 10-12 GW on average, therefore 30+ GW at peak, zero sometimes) they will not make any major investments to upgrade, so there will be a gradual deterioration in their reliability. Now we are being told we must face “demand management”, turning industry and households off to reduce those peak demands. The avalanche is approaching, and the rumbles can be heard. Wont be long before it is mandated. DRED stands for ‘Demand Response Enabling Device’. Which is of course why we were all forced onto “smart” meters. They’re smart all right, but not in the way we were told. Pretty sure there will be multiple pathways to a AS4755 enabled (disabled) device. Just bypass the switching electronics….should be easy enough to do. cut the green wire you say ? If your numbers are correct, and in reasonable terms they are, then when thermal generation capacity falls below 27 GW, a grid collapse becomes likely within a 6 month window. Take even one thermal plant off line after that and it is nearly a certainty. So, you’ve got 10% slack in that “rubber band” to stretch things with. When the interconnector tripped because of broken pylons during a rather “gusty” bit of wind, the ramping rate was some 200 MW/hr. That ramping rate, both up and down, seriously stressed the thermal plants. Add that to the puzzle. Just guessing here, but in the large, AU can afford about 3 GW of lost thermal generation and then the die is cast. Simply a matter of time and luck until the wind blows too much or too little, or the load peaks at the wrong time, or a bearing, winding or blade fails at a thermal plant, or there’s too much cloud cover, or a warm or cold evening occurs. Any combination of these things will trip the grid. Goodbye Civilization. Hello Anarchy. I should like to wonder what the Insurance companies are postulating for losses at that point. Watch the reinsurance rates to see how the risk is valued. When those rates begin to climb, it is time to find a hole and crawl in it. They watch these things. That’s the canary to fixate upon. Property and casualty losses in a protracted blackout are going to be surprisingly large. The biggest issue has been that that the grid operators have been too competent in integrating renewables covering up the inadequacies of intermittent renewables under normal grid conditions. This lulls the masses into thinking all is swell with “replacing” thermal generation with renewables (witness the schoolkids who attended the protest against coal). Some mass load shedding events would be instructive in how our grid is being undermined but, so far, the grid operators have been able to intervene successfully except when transmission failure has given the media and greenwash an excuse as to why the renewables weren’t to blame. It will take a catastrophic generation shortfall event to show the masses what a lie they have been sold by the politicians, media and institutions. While OZ embraces this lunacy the front runner Germany today only generates 3.5% from GEO + S&Wind and is now trying to fix its grid by expanding its brown coal mines. It’s wasted 100s of bns Euros over the last 20 years on clueless S&W for zip return and now have energy poverty because of extreme power prices and they only emit 2.1% of the worl;d’s emissions. How insane is that> Oh and the USA has a much smaller % of energy generated by coal than this front running German donkey machine. The USA only generates just 17.1% of TOTAL energy from coal while Germany generates 25.5% and China 66.7%. All IEA data I have linked to before. One is lauded by the moronic MSM and the other is hated. Unbelievable but true. OH and the hated one has pulled out of the Paris COP 21 fra-d and BS agreement. So do simple KINDY sums count for anything anymore, apparently not? BTW here is that DEC 2015 interview where the father of their CAGW lunacy called Paris COP 21 just BS and fra-d. Thanks Dr Hansen for telling us the truth. Thermodynamics 101 FAIL!!! Heat only transfers from HOT to COLD not the reverse. The SB equation is for FLUX NOT heat! Biggest mistakes from the RGHE. Since when is a useful vehicle (like a Land Rover) a car? It’s a … Land Rover. I linked to Dr Hansen’s interview calling Paris a f r a – d and BS and I’m now in moderation again. These are Hansen’s claims not mine. Oh dear, the Greenies are eating their own: Occasional Cortex finally says something useful; attacks Green golden boy Elon Musk over public funding for Tesla. She wants a return on public investment: there’s a novel idea. Bolt’s incredible talk with their ABC’s science guru???? Robyn Williams is looking even more dodgy with passing of every year. Robyn thought that it was possible that we could have 100 metres of SL rise by 2100, but Sydney is STILL about 0.65mm year and Brisbane even less. OH and 0.65mm/year is about 2.6 inches per CENTURY. Robyn’s wild claims have some catching up to do. In fact way more than 1,000mm a year and still wouldn’t make it by 2100. I don’t think that there is a For Sale sign outside Flim Flam’s waterside home just yet. Its back to 1950s weather. Lomborg tells us about what would likely happen when the AMO changed to cool phase more than 10 years ago. See “Cool It” book. And Dr Curry and others think the switch may have started to cool Phase in 2015. I guess only time will tell. This is a bit old but gives us a glimpse of what is coming. “100 metres of SL rise by 2100,” So Robyn, exactly what is going to supply THAT much extra water? Not from the Arctic where the ice FLOATS! or Antarctic where there isnt enough or Greenland. Pigs have wings too Robyn and Dodos arent extinct. The goal is worldwide carbon taxes and centralized administration. Renewables are just a step on the way. Everyone with any sense (ie. outside the Labor and Liberal parties and their cabal of voters) is suspicious that this has been the strategy all along. ‘The goal is worldwide carbon taxes…’ and total elimination of fossil/hydrocarbon fuels (the only fossil fuel is coal BTW). This will result in destruction of the industrial society as we know it. I think it is the dastardly plan to eliminate us starting with the vulnerable. Correct. This has been the ultimate aim of the occult New Age “Gaia” woshippers from the off. We are just “uesless eaters” to be ultimately culled, to protect thier mythical “Gaia”. Its also worth pointing out we didnt start this stoush…..
Oh, I don’t think the goal is the destruction of industrialized society at all. I think the goal is the centralized control over industrialized society through carbon taxes. CO2 might not be a control knob on climate, but carbon taxes will be the control knob on the global economy. One country getting a little too much power? Raise the carbon taxes there and lower it for other countries. I’m sure the globalists see the failure of communism in the USSR and other crash test nations as just for the fact that it wasn’t implemented on a large enough scale. This Lomborg video tells us the truth about all the usual nonsense from the CAGW extremists. It only only takes a few minutes but covers a lot of their icons, although he has since updated S&W energy numbers since this video was made. S&W are now about 0.8% of the world’s TOTAL energy generation. EU’s IEA data of course. Deaths from extreme weather events have plummeted 97% since early 20th century. We must be doing something right,but I was once roundly abused by a crowd when i dared to state these facts. Seems they just love their CAGW BS and fra-d. There is that number again, amazing how it keeps popping up. Neville I have a problem with lukewarmers, tell Bjorn that CO2 does not cause global warming. The lukewarmers are like do gooders they try hard, I support their effort to fight the climate scam BUT they persist in giving the klimatariat room to move on CO2, which shoots themselves in the foot. They should just learn REAL thermo. None of them are to be trusted or tolerated. The bolshie alarmists bring the pot to the boil then the likes of Lomborg and Curry turn it down to a polite simmer. Nope. Chuck out the whole nasty stew. More amazing than Jo has appreciated. YES!! It’s another 97% consensus! One point being made in the video is the most optimistic assumption about how much of the world’s power is to be produced by renewables is around 2.2% by 2040, and if countries like China and India are to take on board renewables in a much bigger way to have at least some impact on climate (LOL) we need to put more investment into research to make renewables much cheaper (LOL squared). In other words the video is partly about supporting renewables by making it cheaper than fossil fuel and nuclear. The elephant in the room is not even seen – energy storage. Odd how so many are trying to do away with fossil fuel and nuclear without using their brains to see if the solution is solar and wind then we either need to invent a battery storage system that is far more advanced to what we have today (and is probably decades away) or else we need to create a second sun so we always have light. Good luck on either. Haven’t you seen the models for the “greenhouse effect ? So they’ve already solved the sunlight 24 hours a day – now just need the fairy dust to solve the batteries ? How can people believe junk science like this ?? Theres another total mistake used by the RGHE people. The earth IS NOT FLAT, it is spherical and it ROTATES! Look at all the misleading ‘radiation budget diagrams’ ALL are with a non rotating FLAT earth! Also see my comment 15.1. AND there are many false assumptions. Heating effect is not linear, by any means. The whole averaging peak over the whole surface is total nonsense. Unfortunately this train wreck is likely to be so severe whoever offers to fix it with coal fired power will win a landslide and the perpetrators will spend a long cold time in the political wilderness. As our politics stand at present both parties seem to be fighting for the title of perpetrator. The only things that will stop the insanity will be a full blown ice age or the shutting down of our electricity dependent societies and neither of those will be “pretty”. As Robert from IceAgeNow.info says : – If Earth enters a mini ice age there’ll be fighting in the streets for food long before the glaciers advance due to reduced cold induced crop failures. Then there’s the ideology of growing food for biofuels or ethanol. True. Starvation could be a big problem. Ausnet are telling me my supply has become more reliable over the years but wants me to keep my phone charged and learn how to open my garage door just in case , how thoughtful. Here’s Dr Curry on the Bolt report and the second video covers the wild claims from the Attenborough donkey and others like Turnbull who think that sceptics deny that the climate changes. Total nonsense but these fools get a free kick from the MSM every time. Japan is making a play for one of the most politically critical jobs in international climate finance. The head of the upper house of parliament, Gerard Larcher, also sounded the alarm about the insurrectional nature of the “yellow vest” protests which began on November 17. The 40-year-old centrist president (Macron) was heckled Tuesday as he visited a burned-out government building in central France, hours after a new opinion poll showed his approval rating at just 23 percent. A frequent demand from the protesters, who are mostly from rural and small-town France, is a repeal of his move last year to cut a “fortune tax” previously levied on high-earners. I opened up hotcopper . com for the first time in ages and the same old names were still pushing the same old line. Renewable generation installation has accelerated to such an extent it is on track to provide almost 80 per cent of the electricity market by 2030, according to research from consultancy Green Energy Markets.Key points:Rooftop solar installations are up 76pc on this time last yearBy end of the year rooftop solar capacity will exceed that of the closed Hazelwood power station. Renewable financing faces big challenges from the likely collapse of power prices GEM director Tristan Edis said the renewable energy industry has built itself up to such a significant scale that even 50 per cent by 2030, the renewables target being pursued by the Federal Labor Party, would involve a significant contraction in activity and employment in the industry. It’s not as if Peteai has not been informed that 80% unreliables is not a good thing, we sceptics have been telling him for 10 years. He chooses to push the alarmist narrative though. Is the ABC serious when they say that the output from renewables will become so cheap that they will be unable to get finance. Weird! I am totally disgusted at the total verbal C R A P uttered by someone of such prominence as David Attenborough at COP24. He said that we are in for a disaster of proportions that will WIPE out most of the species on earth!! WHAT! Andrew Bolt delivered a scarifying assessment in the Herald Sun today. Remarkably we have our own version of Sir David right here in Melbourne. He is a famous scientist in his own right and has a Nobel Prize to prove it. And he wants it known that he is a passionate advocate of the most extreme predictions of Climate Scientists so he wrote a book. I do not recommend that anyone buys it. I went to the trouble of borrowing the book from a local library. We are so FUBAR’d. Nothing and no-one to date has slowed this crash down. I have supposedly very intelligent and educated friends and colleagues who still tell me that solar is the answer cause “the sun always turns up for work, every”. Those were the words. From SOMEONE LIVING IN MELBOURNE. He still won’t oblige me by doing the maths on power generation. Therefore advocating on blind faith and misplaced optimism. Aka religious fervor. World carbon dioxide emissions are estimated to have risen 2.7 percent from 2017 to 2018. That’s according to three studies released Wednesday from the Global Carbon Project, an international scientific collaboration that tracks greenhouse gas emissions. The Climate Action Network awarded them the dubious honor Wednesday, citing Saudi delegates’ efforts to oppose ambitious efforts to curb global warming. Sabido suggested there should be a “firewall” between corporations and delegates similar to the one that the World Health Organization established to prevent tobacco firms from influencing anti-smoking negotiations..
Britain’s oldest coal-fired power plants prepared to fire up their hoppers for a price of almost £1,000 per megawatt-hour on Tuesday to avert a power shortfall as temperatures across the country plunge and wind power wanes. The cold snap ignited the winter’s first warning that Britain would run out of electricity unless idling coal plants ramp up to help meet demand for power. National Grid said on Monday evening that there was a 100pc probability that the lights would go out within 24 hours unless an extra 2GW of power capacity agreed to help meet demand. 2 Dec: Spectator UK blog: If Britain can’t keep the lights on this winter, will the EU be to blame? If it goes bad, then we can expect a popular English uprising. They should throw the EU out of Britain like the Hungarian govt threw Soros’ Open Society Foundation out of Hungary….. ENGINEERS have issued a warning about the growing danger of a power blackout – leaving Scotland facing deaths, riots and widespread food and water shortages. The report adds: “All UK coal-fired generating stations are expected to close by 2025. Coal-fired and gas-fired generators are important in restoring electricity supply after a system failure. “Wind generators can only have a very limited role in such situations and nuclear generators cannot be quickly restarted. The time to restore supply in Scotland is now estimated in days – several days – rather than in hours. He said: “The system was designed to keep the risk of failure to an acceptable level. For many decades the risk of failure was low. Many of the recipients of China’s largesse—Egypt, Nigeria, Kenya, Senegal, Zimbabwe and half a dozen others—currently have little or no coal-fired power, and no coal to fuel future plants. Worldwide, there are nearly 2,500 30-megawatt-or-larger coal-fired stations in operation, with a combined capacity of about 2000 GW, according to the (Global Coal Plant Tracker). an odd and frosty story! Parts of Regina, Moose Jaw, Estevan and other communities had no power for much of Tuesday. SaskPower official Jordan Jackle said it was caused by heavy frost on the power lines, and repeated that explanation in a follow-up news conference on Wednesday. The frost formed several days ago and worsened with a lack of sunshine, he said. The frost caused multiple lines to fail, Jackle said. SaskPower estimated between 175,000 and 200,000 households and businesses lost power during the height of the blackout. He said ice storms frequently weigh down and damage individual lines, but don’t cause the shutdown of three, or even one, power plants. “It doesn’t cascade up to a region-wide outage. The system should be resilient to handle frost,” he said. Jackle said they’ll review the incident to see if they can learn from it. He said there could be more smaller outages in the coming days because the frost is still thick in some areas. It’s likely not feasible to manually knock the heavy frost off transmission lines to prevent events like this since there are so many power lines in the province, he said. Power remained out late into the night Tuesday just outside Rosetown, but a worker reached at the Dinsmore health centre Wednesday morning said power had returned. All hospitals in the Saskatchewan Health Authority were reporting normal activities and all schools in Regina and Moose Jaw will be open. update plus some lessons for us! Updated 6 Dec: CBC: ‘It’s a good thing it’s not real cold’: Dark winter night during power outage in southeast Sask. Power had previously been restored in Regina, according to a SaskPower tweet, and SaskPower’s outage map showed Estevan, Moose Jaw, Weyburn and all but a small patch in the south-east had turned their lights back on before nightfall on Tuesday. That southeast area, which the Berry’s Carievale, Sask. home is located, was facing a delicate situation overnight that threatened to keep power out through to Wednesday, according to SaskPower’s website. The risk of an overnight outage didn’t faze Maurice, who has a pellet stove and propane heater to keep him and his kids warm, and a generator to keep their TV going. A camp stove is doing the trick for food preparation. As of 7 p.m., he said his home was just a little cooler than usual. “It’s a good thing it’s not real cold. We’re making out alright,” Maurice said. The generator is an investment he’s made after similar outages over the past few years. One of them was as long as 30 hours, right in the midst of winter. Others in the area have gone so far as to buy standby generators that can power their whole farm. Maurice pinpoints heavy frost, mist and ice that weighs down power poles as the cause for these repeated outages. SaskPower’s Jordan Jackle agreed that the sagging power poles have been an issue and SaskPower will be looking into as the possible cause for the power woes over the past 24 hours. Had the outage continued in their area, Maurice and his mother had both been planning to turn their propane stoves off at night. Duane McKay, commissioner of Emergency Management concurs. SaskPower advised that reducing stress on the system while they repair the system will help out. That means holding off on using the dishwasher and washing machine, unplugging unused electronics and bumping down the thermostat. To keep from putting power crews in danger, SaskPower asked to only use generators that have a switch, since poorly installed generators can feed power back into the lines. “We’re not totally out of the woods at this point. We need the sun to come out and start burning off some of that frost out there,” Jackle said. It’s likely the largest power outage in the province since 1981; the blackout has affected about 200,000 customers, leading many of them to public spaces. “We saw a much bigger reach this year than we did last year on a similar date. The food court was a big increase; people going out for lunch swung by the mall to grab a bite. It was pretty busy,” said Jesse Manastyrski of Southland Shopping Centre in Regina. But for some, the experience wasn’t as positive. Due to Tuesday’s power outage, Souls Harbour, a local shelter in Regina, was forced to shut down its kitchen and chose to close its doors for the night, saying the organization was not able to cook or keep the place warm, which required Souls Harbour to send people elsewhere. “The dorm itself was full, which houses 40 people,” said Wayne McDonough, executive director of the Salvation Army Waterston Centre, of the facility. McDonough said Salvation Army’s biggest challenge on Tuesday was providing food. “All we could really do last night — because our kitchen was shut down and dark — was provide them with sandwiches and some of the basics,” McDonough said. For now, SaskPower believes the worst is over, but the utility is still encouraging residents to limit their power consumption. Must be a slow news day…..
“Both the UN Environment and the Intergovernmental Panel on Climate Change (IPCC) sounded the alarm over the dire climate trajectory we’re on, and the huge efforts needed to limit warming to 2 degrees Celsius above pre-industrial levels. And in June, research published in Nature pointed to a tripling of the rate of melting of the Antarctic ice sheet over the last five years. Now, new research published in Nature today has confirmed a similar trend is occurring in the Greenland ice sheet. Researchers used ice cores to create a 350 year continuous analysis of the melting rate of ice in central west Greenland. An ice core is a sample taken from an ice pack with a hollow drill, revealing a cross-section that effectively looks back in time, a bit like the rings of a tree. They found that over the last 20 years, the rate of melting has been as much as five times as high as pre-industrial melt rates, and that the rate of melting is increasing, according to researcher Luke Trusel from Rowan University in the United States. “The main conclusion that we found is that it’s now melting more in recent decades than any time in the last four centuries, and probably more than any time in the last seven to eight thousand years,” Dr Trusel said. According to their ice core samples, 2012 was “unambiguously” the most intense melt year on record in Greenland. An increased rate of melting was detected in the ice cores beginning in the mid-1800s, which was around the same time as the onset of industrial-era Arctic warming. But it was only during the 1970s that the melting clearly breached the natural range of variability. Significantly, they’ve confirmed that the increasing melting rate is following an exponential trajectory, caused by positive feedbacks like the albedo effect, according to Dr Trusel. “Significantly, they’ve confirmed that the increasing melting rate is following an exponential trajectory, ” Thats is a total lie based on the Danish Met service which reports the Greenland Ice sheet is INCREASING! Ya mean they started basically in the middle of the Little Ice Age. DOH !!!!! THANK GOODNESS for the NATURAL warming !!! An increased rate of melting was detected in the ice cores beginning in the mid-1800s, which was around the same time as the onset of industrial-era Arctic warming. But it was only during the 1970s that the melting clearly breached the natural range of variability. And all this time, at the same time, coincidentally and in parallel, the increasing ice pack, yes, increasing snow and ice cover, was adding, yes, that’s correct—adding about/around/circa 1.8m per year, yes, that’s correct: almost 2metres per year) to the entombing of Glacier Girl one of a flight of Lockheed P38 Lightning fighters and some Boeing B15 bombers which were forced down on the south east (the warmer part) of the Greenland Glacier in 1942. The aircraft were discovered using ground-sensing radar, some 264feet below the surface. You can read all about it at the link above. … buried 264 feet in ice over about 40 years is a fantastic rate of melting. The best I’ve ever heard about. Glacier Girl has been restored and is in good flying health, yet the prats/fools/idiots/Deniers who still write this cruft/rubbish/fake news/propaganda can’t do some basic Internet searching—how hard is it to use an Internet Search Engine anyway?—and don’t even bother to find out for themselves. “Polly wants a cracker! Squaaaaawwwwk! Right b****y NOW! ABC maths never got me more riled than when they claimed electricity bills had only increased by A THIRD IN TEN YEARS!!!!!! ***Over the past 10 years, Australians have opened their energy bills to see an increase of ***35 per cent. CHECK OUT SOME OF ABC’S JACKSON GOTHE-SNAPE’S OTHER ARTICLES! SBS BIO: Jackson Gothe-Snape: Jackson Gothe-Snape is a journalist working for SBS in Canberra. He creates stories with help from trusted contacts, cold calling, code and data. A former lawyer and public servant, he has worked in the Parliamentary Press Gallery since 2013. Will Aunty ever learn? Its latest effort is entitled “Every big business that would benefit from the company tax cut, in one chart” by Jackson Gothe-Snape, published online last week. It flourishes an extravagant graphic of Australia’s largest publicly-traded corporations’ gross revenue (for fiscal year unknown). Nothing about their profits (before or after tax) or their tax inputs over a fair cycle. ***Herein lies Aunty’s mortifying failure of self-realisation: nobody there seems to understand the difference between revenue and profit, let alone the catalytic incentive offered for capital multiplication by favourable tax jurisdictions. This is an ideological disease born of free school education, then free university, then comfortable employment at a free media outlet (paid for by the taxpayers it impugns with impunity) baiting them to unmask the rapacity of capital. Yes Pat the ABC are no good at maths , as we know more people die from cold related injuries but not the ABC . Totally OT but just heard on Credlin , the Govt evacuated an asylum seeker from Nauru to the mainland on emergency medical advice , they are reporting that the asylum seeker was treated for constipation but once in OZ all medical referrals are jumped on by ambulance chasers who put an injunction on them being returned. No medical evacuation illegal immigrant is returned because of this , now Labor and their Green mates have passed an amendment in the upper house to ensure that more of this happens in future . The cost of evacuation for the one patient was estimated to be $100,000.00 , now any two doctors anywhere on the island or on oz can sign a shonky medical certificate to evacuate an illegal immigrant from the island and once they land in oz their here to stay . Labor and the Greens have put the people smugglers back in business . I had to have a colonoscopy recently. I still have one of the sachets of “prep” that I needed to take. For a few bucks I could have posted it to him. I guarantee it would have cured his constipation and what’s more I also guarantee that he would not have been able to hide that fact. Take the doctor to the patient, ’twill be cheaper. Go for it SA and Vic. Tassie doing well until they run out of water again. No contest. Red Dan makes Jay look like a weekend amateur. Just as soon as I can get probate granted I’m selling and leaving. Most smart folk ( I don’t include myself ) have already bolted. The gullible ones voted for him. I don’t see why I should suffer. If we want consumers to actively engage with their electricity, information and support must improve, says new report from Energy Futures Lab. A new report published by Energy Futures Lab (LINK) has drawn up recommendations for how the energy industry and UK government could increase consumer engagement with the new breed of smart energy technologies and services. The report’s authors conclude that providing consumers with more detailed information, the right tools to help them make choices and the ability to easily act on these decisions are key if we want “smart” consumers. One of the challenges of our current energy system is matching supply with demand. To ensure we can keep the lights on every evening there needs to be a large amount of energy being generated but conversely the amount of energy needed at 4am is small in comparison. It is hoped that the introduction of devices like smart meters and domestic battery storage alongside new kinds of electricity tariffs will allow us to smooth out this demand through Demand Response (DR). This would mean moving some demand, e.g. running a dishwasher, to a time of lower demand, which would also mean a cheaper rate. In the report ‘Energy Revolution: A Global Outlook’, researchers from Imperial College London have assessed 25 countries, covering 80% of the world’s population. Uptake of electric vehicles is also among the highest in the UK, which is home to the world’s fifth largest electric vehicle fleet. However, progress in the UK is being hampered by the fact it lags behind on the provision of large-scale carbon capture and storage facilities, says the report, needed to limit the harmful greenhouse gases accumulating in the atmosphere. New legally-binding carbon emissions targets for Wales have been announced. They set the path towards an overall reduction of 80% from 1990 levels by 2050. Because of Wales’ heavy industry like steelworks, power generation and its agriculture, this presents a particular challenge. Ministers want emission cuts through the likes of more sustainable transport and energy efficient buildings to be “at the front and centre” of policies. An action plan with further details about how these much deeper reductions in emissions can be achieved will follow in March. The problem for Wales is that the sources of more than half of all emissions are beyond the direct influence of the Welsh Government. Okay. Are we going to get a decent Bond film out of this saga ? “We aim to be a carbon neutral country by 2050, we aim to be net zero of all greenhouse gas emissions as soon as we possibly can achieve that and we will achieve that by taking action across a range of sectors. “We have already substantially decarbonised our electricity supply, we aim to meet at least half of all of our energy needs from renewable sources by 2030. Sturgeon went on to highlight the economic advantage for countries that become “early adopters and innovators”. With a population of five million, Scotland had a “significant” low carbon and renewable economy, with 50,000 jobs. The FM went on to outline how the proposed Just Transition Commission would work by demonstrating that there was nothing to fear with a low carbon economy. She said: “We will be working closely with civil society, trade unions, the NGO community and private companies to demonstrate that there is nothing to fear and everything to gain from the transition to a low carbon economy; that we can create new jobs that replace jobs in the older industries; and that those jobs can often be higher skilled, better paid. Earlier, African climate leaders had called on the Scottish Government to raise its ambition on climate change. In a letter to Sturgeon, the Pan African Climate Justice Alliance (PACJA) – representing more than 1000 member organisations from 45 African countries – praised Holyrood for its pioneering efforts so far, notably the “bold step” of launching the Climate Justice Fund which has been emulated elsewhere. However, its executive director Mithika Mwenda said that in light of the UN Intergovernmental Panel on Climate Change (IPCC) report, Scotland must respond by “putting in place measures to drastically cut its emissions as science demands”. “For communities in Africa devastated by the adverse effects of climate change, we keep hoping against hope that countries like Scotland will rise to the occasion and stand to be counted as the global community rallies against time to avoid the precipice,” he said. I’ve been wondering which episode of Star Trek The Original Series , does this story most resemble. It’s all part of life’s rich pageant , I suppose. A rare ice fog enveloped China’s northernmost city of Mohe, with the temperature dropping to minus 42.7 degrees Celsius and even to minus 43.5 degrees in a village. A cold wave sweeping across the country has pushed the mercury down by 6 to 8 C across much of central and eastern China, prompting the National Meteorological Center to issue its second blue alert for a cold snap this week on Wednesday. The cold spell is expected to persist through Sunday. As it heads south, the freezing air will reach as far as the middle and lower reaches of the Yangtze River, the center said. Under its influence, the temperature in Beijing will drop to -10 C or lower this week, the coldest in at least a decade. The coldest early December day in recent years in the city was Dec 5, 2008, when temperatures fell to-10 C.
Before the freezing air poured into large parts of China, the country’s northern areas had already been hit with wind chills and heavy snow. As many as 5,000 tourists were stranded at Urumqi Diwopu International Airport in northwestern China’s Xinjiang Uygur autonomous region on Tuesday after about 100 flights were canceled due to days of heavy snow, China National Radio reported. China’s northernmost city, Mohe in Heilongjiang province, issued a red alert for a cold snap on Monday, its first since records began, before the mercury plunged by 22.1 C to -41.1 C on Tuesday and dipped further to-42.7 C on Wednesday. A shroud of white mist blanketed the city streets on Wednesday morning as water vapor in the air froze, rendering visibility outside to less than 100 meters on Wednesday morning. “We have dispatched police to key sections of the roads to guide traffic and prevent accidents caused by frozen ice or snow,” said local police officer Wang Zhijia, who had donned his heaviest clothing to brace against the bitter cold. Frigid air triggered a provincial level orange alert – the second most severe – by the Heilongjiang Meteorological Bureau on Tuesday as Harbin, the provincial capital in the south, saw a low of -20 C this week. However, the deep freeze engulfing North China hasn’t damped down the passion of tourists heading north to see the winter spectacle. Tan Jian from the eastern province of Jiangxi visited Mohe on Wednesday and reveled in throwing a cup of boiling water in subzero air, which instantly froze into an ice-mist spiral. “It’s absolutely beautiful and exhilarating. The scene is unique to this place and I came here to experience the coldest of North China,” he said. -43.5℃! People enjoy “splashing water into ice” in Mohe, the northernmost city in China, located in NE Heilongjiang Province. —just as the Sun goes into a minimum, opening the atmosphere up to the highest intensity of GCRs (Galactic Cosmic Rays) we have ever/so far measured since the start of the space age. GCRs are now known to aid/assist/help in the generation of low level clouds, the rainy/snowy/sleety/hailing ones. Increasing cloud cover lowers temperatures. Increasing cloud cover increases rain/hail/snow showers as in deluges—hail and PV panels were just made for each other! Increasing cloud cover lowers the efficiency of PV panels. Oy vay! —solar power suddenly doesn’t look so good, seeing as we have another two years to go before we reach the true minimum and then we have to come out the other side. Oh, that’s okay, there’s always really cheap wind. Yup. It’s so cheap, it’s hardly ever there. The really good news about wind is that, just as PV cells are losing the sun, the planet’s reserves of wind are also … falling. That’s right Nature: do it again, another one, c’mon: one, two! That’s the stuff! And to top it all, the darned planet sets out to enjoy a magnetic pole swap, with the planetary magnetic field having lost over 15% of it’s field strength, allowing more Solar Wind into the Ionosphere where it can wreak more of its deviltry with human health, (strokes, heart attacks etc) planetary health (big 6 + earthquakes) and volcanoes and really stir up the weather. 10% of that field strength loss was over the last couple of centuries, 5% of that was over just the last decade. Oops! The Yellowstone Supervolcano in North America has a pretty regular periodicity of 600,000 years. It seems to be stirring. It went off last time 600,000 years ago. It may be filling its magma chamber(s) right now. C’mon Ma Nature: put the Boot In! Put it in! Harder! Harder! And we’re expected to worry about livestock? Methane? (-1 ppm/v) Batteries? (yeah, we could get a damned good battering soon!) EVs? and all the other rubbish the True Believers are lining up on the pike for us? And hello: now Yellowstone, no, not that one! I sure hope not!. Serendipity … don’t you just love it? That’s all very well, but I’ll bet that the sheeple can be conned into believing that big coal is responsible for all of that. Or capitalism. Or grumpy old white men. Or, of course, J*ws. I forgot heterosexuals. Nearly everything is our fault after all. Is this Nature’s about to put the second boot in? Now, I’ve not checked the arithmetic at all … yet, but if you find it interesting, you may like to cross check it for yourself. It’s not arduous, and should take not a lot of time at all. You won’t even need to look up G (the gravitational constant). Heh, a fourth problem to put on the stack. Should the UN be worried? Well, if it’s not Business As Usual, then 2100 will not be 2.0°C or any larger number over the present temps, not even 1.5°C, It might be 3°C, 5°C, or less as in below present temps. Zharkova did mention some of this. Heh, this is a good exercise for Twinotter et al. and all the other trolls, such as Philthegeek etc. According to the Daily Telegraph, the UK had to bring old coal generation – presumably plants not yet closed and then dynamited almost the second the gates closed – back to avoid running out of power. The intermittent use of these plants meant they were being paid £1000/Mwh. Some green knob will be wailing out fossil fuel subsidy no doubt but then if it wasn’t for the subsidies for wind and solar and the carbon tax, there would be no need to overpay. Heading for 38 degrees in Vic and SA today, the sun is shining, the wind is blowing strongly (capacity factor over 60%), what better time to illustrate the low costs of “renewables”. But current wholesale spot prices are over $110/MWhr, with forecasts for the evening of $10,000/MWhr. Meanwhile in Qld/NSW prices are $70-80/MWhr.